A radiologist's ability to make accurate diagnoses from high-quality diagnostic imaging studies directly impacts patient outcome. However, acquiring sufficient data to generate the best quality imaging comes at a cost – increased radiation dose for computed tomography (CT) and positron emission tomography (PET) or uncomfortably long scan times for magnetic resonance imaging (MRI). 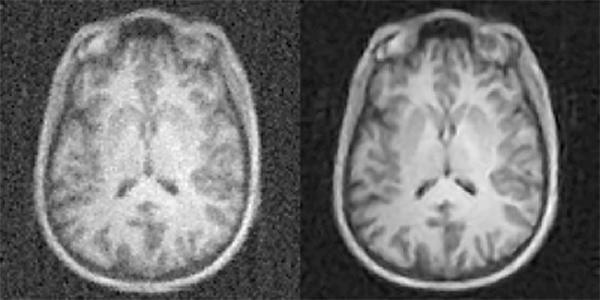 Now researchers with the Athinoula A. Martinos Center for Biomedical Imaging at Massachusetts General Hospital (MGH) have addressed this challenge with a new technique based on artificial intelligence and machine learning, enabling clinicians to acquire higher quality images without having to collect additional data. They describe the technique – dubbed AUTOMAP (automated transform by manifold approximation) – in a paper published today in the journal Nature. "An essential part of the clinical imaging pipeline is image reconstruction, which transforms the raw data coming off the scanner into images for radiologists to evaluate," says Bo Zhu, PhD, a research fellow in the MGH Martinos Center and first author of the Nature paper. "The conventional approach to image reconstruction uses a chain of handcrafted signal processing modules that require expert manual parameter tuning and often are unable to handle imperfections of the raw data, such as noise. We introduce a new paradigm in which the correct image reconstruction algorithm is automatically determined by deep learning artificial intelligence. "With AUTOMAP, we've taught imaging systems to 'see' the way humans learn to see after birth, not through directly programming the brain but by promoting neural connections to adapt organically through repeated training on real-world examples," Zhu explains. "This approach allows our imaging systems to automatically find the best computational strategies to produce clear, accurate images in a wide variety of imaging scenarios." The technique represents an important leap forward for biomedical imaging. In developing it, the researchers took advantage of the many strides made in recent years both in the neural network models used for artificial intelligence and in the graphical processing units (GPUs) that drive the operations, since image reconstruction – particularly in the context of AUTOMAP – requires an immense amount of computation, especially during the training of the algorithms. Another important factor was the availability of large datasets ("big data"), which are needed to train large neural network models such as AUTOMAP. Because it capitalizes on these and other advances, Zhu says, the technique would not have been possible five years ago or maybe even one year ago. "Since AUTOMAP is implemented as a feedforward neural network, the speed of image reconstruction is almost instantaneous – just tens of milliseconds," says senior author Matt Rosen, PhD, director of the Low-field MRI and Hyperpolarized Media Laboratory and co-director of the Center for Machine Learning at the MGH Martinos Center. "Some types of scans currently require time-consuming computational processing to reconstruct the images. In those cases, immediate feedback is not available during initial imaging, and a repeat study may be required to better identify a suspected abnormality. AUTOMAP would provide instant image reconstruction to inform the decision-making process during scanning and could prevent the need for additional visits." "Our AI approach is showing remarkable improvements in accuracy and noise reduction and thus can advance a wide range of applications," Rosen says. "We're incredibly excited to have the opportunity to roll this out into the clinical space where AUTOMAP can work together with inexpensive GPU-accelerated computers to improve clinical imaging and outcomes." The other authors of the paper are Stephen Cauley, PhD, and Bruce Rosen, MD, PhD (no relation to Matt), of the MGH Martinos Center and Jeremiah Liu of the Harvard Chan School of Public Health Department of Biostatistics. The work was funded in part by the National Institute of Biomedical Imaging and Bioengineering. A patent application related to AUTOMAP has been filed.